There is no way to defend yourself from prejudice and ulterior motives. When faced with covert and overt actions that are based on the illusion associated with a genocide, people keep trying to defend themselves and family, but there is no way to stop the oppressors and overcome the illusion. It is futile to even try, yet for the last several years, potential members of our organization have been trying to defend themselves and innocent people, believing that by fighting the oppressors, they are having an effect. They aren't, because when someone resists, behind the scenes people are being punished their resistance. Innocent people are being backed into the corner just because they gave the oppressors the benefit of the doubt. They are run into the ground. The power the oppressors have is in weaving the illusion, and the joy is in outsmarting the people who stand on the principles. The oppressors believe they are victims. Who are the oppressors? When you see someone perpetrating an act of violence, that person may have been dragged into the conflict with a lie. Is someone who was dragged into the illusion with a lie, not based on ideology or conspiracy, the oppressor? It is important to understand how the power games work and why they don't work. Young people are most susceptible to the illusion, but anyone who gives others the benefit of the doubt is susceptible, and who accepts something from the person who is weaving the illusion. What draws people into the conflict is the belief that you have the right to get revenge on someone. It is the act of betrayal that turns you over to those who would drag you into crisis. 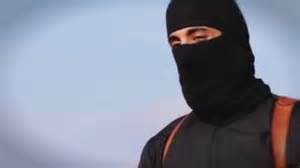 The dead eyes of the young man known as Jihadi John tell the story. From early photos, he appeared to be a young man who had plan for his life, and being dragged into the conflict destroyed his plan for his life. Genocides keep expanding until someone says stop. This is why people call for a genocide watch, because a sense of "you are not outsmarting anyone" comes into effect. We see you. We know what you are doing. When backed into the corner, you can continue to be squeezed until you die or you can come out fighting the overpowering force and die. The final choice you make in your life is whether to die quickly or slowly, but what is not evident is the choice to function on a higher level, and to use the crisis to your advantage. The solution is to do what is in everyone's best interest. Rather than to fight ISIS, the solution is to introduce the plan for the international government and debate it. It offers solutions to every crisis. It is smart. It allows everyone to function on the higher level. The first step is to address the power game of revenge--and where true power comes from, and to understand that there is always a backlash to the power games because they do against Universal Law. If you look at the Track Our Progress planning stages and steps, you will see that for every proposal, one of the steps is to purify the US legal system. Even proposals that are specific to another nation have one stage based on purifying the US legal system. We are introducing 60 proposals! But, we are offering our Constitution as the basis for the international government, and before it can be applied, we must purify practices and policies that have created chaos within our legal system to prevent the chaos from spreading onto the international level. We start with the principles of Universal Law of Cause and Effect. Our legal system has three levels--Universal Law, Constitutional Law and federal, state and local laws. Universal Law fixes our legal system on a very high level. So high that if there are aliens in our galaxy, if our legal system was based on that law, we could find a sense of equality with them, because it affects every atom in the Universe. Revenge goes against Universal Law. It functions on a very low level. Doing to others what they have done to you is a sign that you are losing your power base because you are about to face the backlashes from Universal Law. So, let's unify the planet's legal system by taking it to the higher level. Then, we can address the counterpoint of that--conflict resolution.